I’m not the first to comment that biopics about a musician struggling with fame, drugs and their own demons are nothing new, we have two out at this moment with this and Amy. 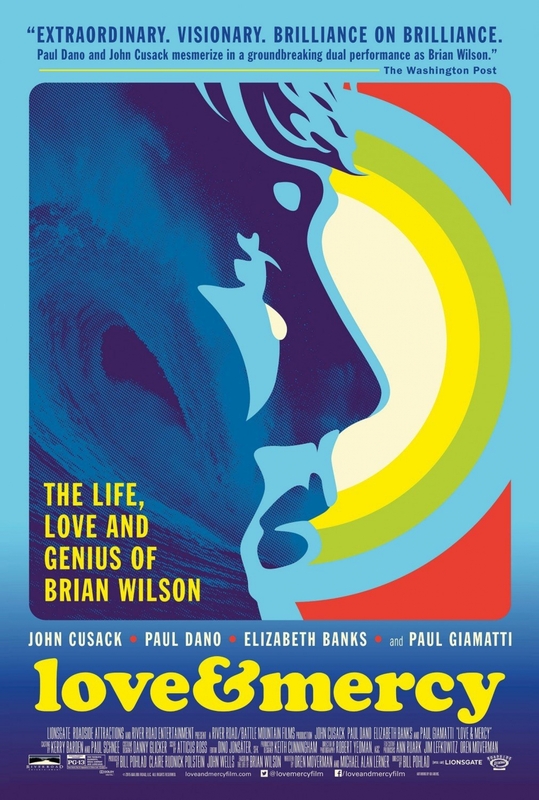 But in this look at Brian Wilson (of the Beach Boys) you will find something far greater than your average biopic. Writer Oren Moverman, who wrote the Dylan movie I’m Not There in which the character of Dylan is played by half a dozen actors, approaches Wilson’s narrative by fragmenting it between the 60’s during the genesis and recording of Pet Sounds, and the 80’s when he has become a recluse stricken by his debilitating illness. Paul Dano plays Wilson in the 60’s and John Cusack takes him on in the future role. There is a moment during one of Wilson’s recording sessions when a confused musician asks him why the base line is in two different keys, she thinks it is a mistake, however Wilson explains that it works in his head and sure enough he is right. There’s a parallel here I think with the dual casting of Paul Dano and John Cusack. Neither looks like the other, and although they are playing the same character they are at severely contrasting stages of their lives. The technique shouldn’t work; your gut tells you that they should either be jarringly disconnected or not have enough collective impact and thus sink into mediocrity, however instead of that the two elements ignite when put alongside one another. Just like Wilson’s melodies the film gains its strength by its different jarring elements both bouncing off each other and fusing together, illuminating certain truths and helping to obscure others. The film wouldn’t be half of what it is if it was purely set in either time line. By placing them in parallel each is allowed to comment on and infuse the other with a deeper and more profound sense of who Wilson was, is and what it was like to be in the studio with him during the sixties. 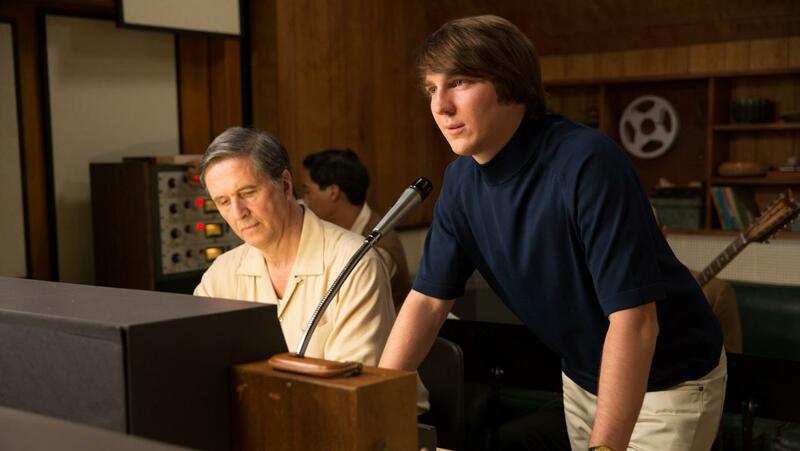 In the role of Brian Wilson Paul Dano cements his reputation as being one of the most gifted actors working today. When he portrays the musician composing his work we keenly feel his pure and unrestrained joy, then when he is away from his music we can sense great waves of pain, anger and frustration crashing around inside his mind. What makes this so remarkable is that Dano manages to hold both the wide-eyed child and the raging artist on the screen at once. It is quite some achievement that Dano can create such a portrayal; not just because the frustrated artist aspect is an impressive feat to pull off without slipping into melodrama, but because the technical ability to suggest that through the presentation of a boy-ish innocence is extraordinarily difficult and results in a work of considerable skill and power. Of course there is also Cusack to discuss who does some excellent work here in the later incarnation of Wilson. He doesn’t impress as much as Dano but still provides a moving and emotionally vulnerable portrayal which is responsible for infusing a fair part of Dano’s scenes with their heart-wrenching power. Alongside Cusack we have Elizabeth Banks and Paul Giammati who play the supporting heroes and villains respectively. Both are painted with broadstrokes; Banks’ character being perhaps a little sanctified and Giammati’s playing a villain so villainous that he may as well have been twirling a moustache. However both actors give their roles their all and thus help raise them above their thinly drawn origins. There is plenty to say about Love and Mercy and not enough room to say it, I’m sure that I will return to talk about the film again, perhaps after more time has passed and I can talk freer without fear of spoiling the film. Until then though I urge you to go and see this one, it’s a powerful and genre invigorating must see. What is the film’s greatest strength? There’s plenty to recommend here but Dano is its strongest aspect. Its greatest weakness? The script, which is otherwise excellent, does paint the two lead supporting charcaters a little too thinly. Would I see it again? Absolutely, this is one of the best films of the year so far. 2015 has been pretty strong for me, too. It’s a toss-up between ‘Love & Mercy’ and ‘Two Days, One Night’ for me right now as for my absolute favorites. Ah see Two Days, One Night was a 2014 film for us so I can’t count it! I think it would be between this, A Girl Walks Home Alone at Night, Duke of Burgundy and Whiplash for me. I am really hoping to catch this over the weekend. It sounds great. You could do far far worse my friend! You’ll have to let me know what you think if and when you see it!